The Peanut Basinofwest-central Senegalisanagricultural region that has been under intense cultivation since the 19th century. The last remainders of the original woody savannas in this region were cleared in the early 1900s, leaving in its place an agricultural parkland dominated by Faidherbia albida. Mechanization of the peanut production required farmland to be cleared of trees, which resulted in dwindling tree densities in (parts of) the parkland. The reduced tree cover combined with meteorological droughts brought about soil erosion, dust storms, and decreasing crop yields (Hirai, 2005). The community of Mbar Diop, in the coastal part of the old peanut basin, has managed to turn this negative trend around. The Projet de Reboisement Villageois dans le Nord-Est du Bassin Arachidier (PREVINOBA – Village Afforestation Project of the Northwest Peanut Basin) began working in the area in 1987, promoting agroforestry activities with awareness campaigns on the importance of tree cover for sustainable farming. The tenure situation — trees belong to the farmer who plants them — was favorable in that it encouraged individual investments in afforestation. As a result, since the intervention of PREVINOBA, many orchards have sprung up, and the tree densities increased visibly. A series of high resolution images illustrates the land cover dynamics over time. 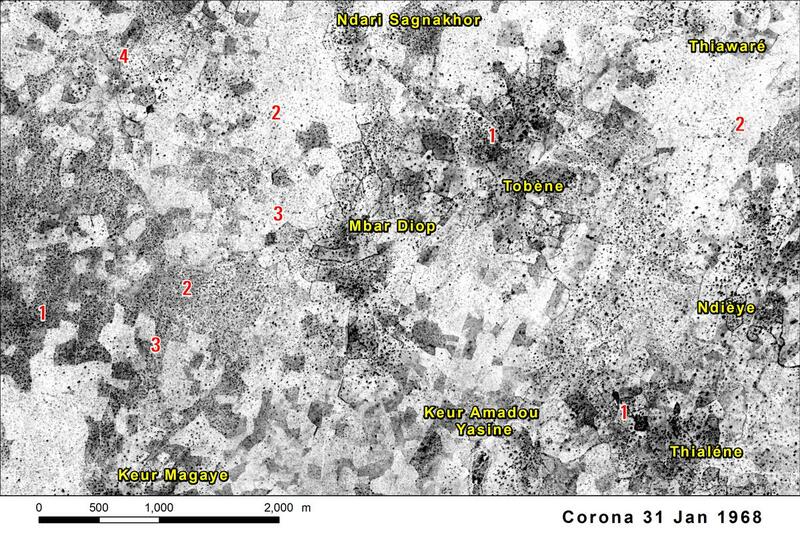 A Corona space photograph from 1968 (see above image) shows remnants of relatively dense tree and shrub cover among the cultivated area (1). By 1989, the region had undergone a series of drought years, which, combined with increasing population pressure and the prevailing agricultural strategy of totally clearing field trees for the ease of mechanized agriculture, resulted in a noticeable decimation of the tree cover (2). 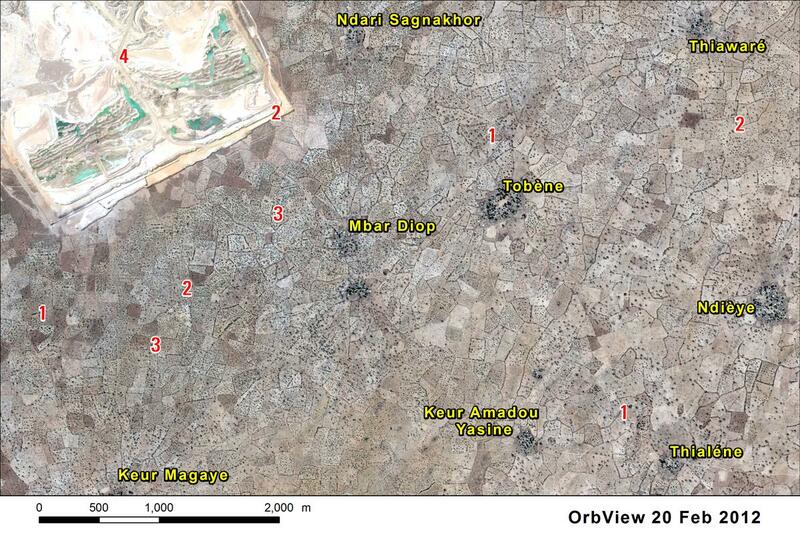 The Orbview satellite image from 2012 (see above) shows the recovery of field trees, notably in the PREVINOBA intervention area around Mbar Diop (3). In addition to field trees, live hedges have contributed to the overall woody cover and act as windbreaks. Orchards increased from 27 percent of the cultivated area in 1989 to 58 percent in 2012. In the highest density orchards, up to 140 trees per hectare can be counted. The population of Mbar Diop is well aware of the multiple benefits they draw from the trees. Dust storms have become less frequent and there is more shade. Some of the plant and animal species that had disappeared have returned to the area. They also attribute the fact that rainfall has improved recently to the increased tree cover. The economic benefits from the afforestation are also considerable. The sale of wood, nuts and fruits is estimated to generate a revenue of 1,500 to 2,400 US$ per hectare and year. In addition, yields of field crops have improved. However, the success of the afforestation investments is threatened by a mining operation, which can be seen to encroach the area from the northeast (4). It has already displaced villages and continues to expand toward the densest orchards, causing great concern to the population of Mbar Diop. Not only do they fear for the existence of the village and its territory, but they already feel the impacts of the chemical pollution coming from the phosphate mining. A discussion and settlement of the land use competition between farmers and the mining concession is urgent.